Last weekend, I had the opportunity to perform a concert alongside of two highly talented area artists. Together, we compiled some of the greatest pieces of art, poetry, song, and music from the Romantic Era, and performed it as a benefit concert for the Jacksonville Symphony Orchestra. Here is a transcript of the short lecture I gave in the concert prior to my performance of a Chopin nocturne. “As you’ve seen so far, in the Romantic era, music, literature, and art expanded to greater heights and depths of expression than ever before. 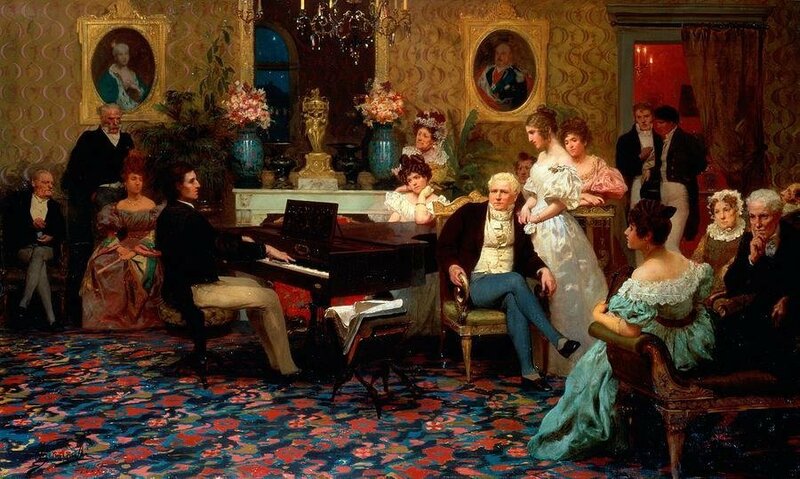 In Music, there was a wider range of dynamics, and register, in the orchestra, in the chamber, and at the piano. In the Romantic era, the pianoforte emerged in all it’s glory – a modern monster of wood and steel, defying the limits of harpsichords and clavichords from baroque and classical days gone by. “Frederick Chopin was at the head of it all, being one of the first pianists to employ a healthful and artistic whole-arm piano technique – one that respected the physical demands of the instrument that grew in power during this era. He was also the lead developer of several new styles – including the concert etude, which you heard at the beginning of this program, and the nocturne. “However, with his intrigue in developing the new musical styles of the day, there was an age-old performing practice to which he held – that of performing from the score, not from memory. While later Romantic artists of Liszt, Schumann, and others propagated the freedom and engagement with the audience a composer can enjoy while playing from memory, Chopin expressed anger and disgust at this newfangled practice, saying that to play without the score was to ‘exalt oneself above the composer of the piece,’ and was, ‘inappropriate, casual, and arrogant.’ In respect of this great man and his work, I leave his score in place on my piano as I bring you Chopin’s Nocturne in B Major, from Op, 32, No. 1, written in 1837. “There is a lovely simplicity and piece to this Nocturne that I truly love. It’s almost glassy in appearance, and texture, with very Chopinesque melodic contour. It is almost pastoral in some moments, and majestic in others. Copyright © 2018-2019 Anna Ferraro Music ∙ Designed in 🇺🇸 ∙ Johnson Marketing and Media, Inc. Designed in 🇺🇸 ∙ Johnson Marketing and Media, Inc.